We were traveling near Bakersfield, California and came upon this very large field of cantaloupes. The Romans, in Italy, learned to grow cantaloupes from the Egyptians. The cantaloupe is named after the town of Cantalupo in Italy, so cantaloupes have been grown for long time. Approximately 75% of the cantaloupes grown in the United States of America are grown in CA. Bakersfield is located in the lower San Joaquin Valley, sometimes called the Central Valley. 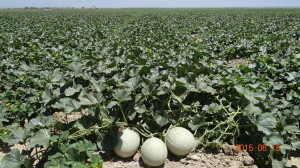 Cantaloupes in the Central Valley are planted from early April until mid summer. The fruits require about 90 days before they are ready for harvest which takes place between June and October. During this growing period the weather is normally hot and dry which makes irrigation a necessity. The low humidity and lack of rainfall helps prevent foliar and fruit diseases. It is important that the cantaloupes are ripe before they are picked because up to 50% of the sugar content is created in the last week of ripening. The melon is ripe when it’s color changes from green to a yellow / tan color and the “netting” shows a distinct contrast. Melon ripeness can also be determined when the fruit separates from the vine or “slip stage”. The sugar content stops increasing at this stage. The melon will continue to ripen after harvest and become juicer. Cantaloupes should be refrigerated after they are cut open. Similar to other types of melons, there are both male and female flowers on the same cantaloupe plant. The male flowers develop first, followed by the female flowers. Honeybees are required for pollination. 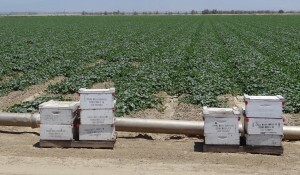 Honeybees are brought to the field by a beekeeper and placed surrounding the whole field of cantaloupes. The placement of the bee hives helps achieve uniform pollination and helps maximize yields of premium fruit. Since the honeybees require pollen and nectar for their survival, the honeybee hives are removed after blossoming is completed. The honeybees are then moved to another location, where another food source is available. 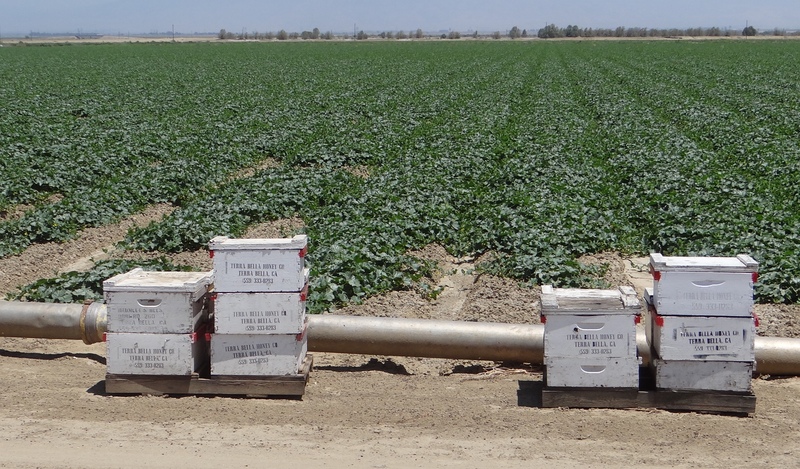 The beekeeper is paid for this service which is critical to the success of so many agricultural crops in CA.